The Eagle Club is a non-governmental organization whose members have studied, observed and protected eagles for decades. Currently, the Eagle Club comprises 29 members who occupy themselves with research on eagles and black stork and their protection in Estonia. feet are yellow. The plumage of young birds is dark brown, making them easily confused with spotted eagles, especially in case of a brief encounter. However, the white-tailed eagle is significantly sturdier than the spotted eagle and its wing movement is slower. 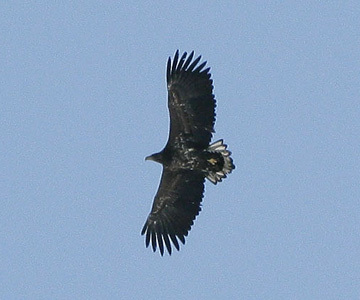 Visually, thewhite-tailed eagle is reminiscent of aflying carpet. The white-tailed eagle feeds in coastal sea areas with shallow water and in larger bodies of inland water. Some pairs have adapted to hunting in fish ponds, thus “robbing” the ospreys of their prey. The staple diet of the white-tailed eagle includes waterfowl (ducks, grebes, gulls) and fish, in wintertime also carrion. In Estonia, adult white-tailed eagles are usually sedentary, while younger birds move around quite a bit. The nesting places are usually located in fully grown coastal pine forests, mixed forests, or on bog islands. A pair of nest at the top of an old pine or aspen, and a nest that has been used for decades can weigh nearly a ton. White-tailed eagles begin repairing their nest already in the middle of the winter, adding green pine branches to the construction. A full clutch, 1-3 eggs, has usually been laid by the second half of March. The white-tailed eagle must brood for approximately 38 days without break. Most often two fledglings have learned to fly by the beginning of July, but almost every year, clutches of three have been seen near better hunting grounds. The white-tailed eagle is apparently native to Estonia. The first written records of white-tailed eagles encountered in the Baltic States date back to the final quarter of the 18th century. 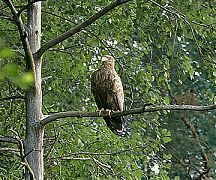 In 1815, the white-tailed eagle has been mentioned as a bird that is not particularly rare in Estonia, especially near Lake Peipsi. Based on the observations of ornithologists from the 19th century, the number of white-tailed eagle pairs can be estimated at no less than 30. A decrease in the numbers of white-tailed eagles evidently began during the last quarter of the 19th century and culminated during the 1960s, when no successful nestings were reported for several years. 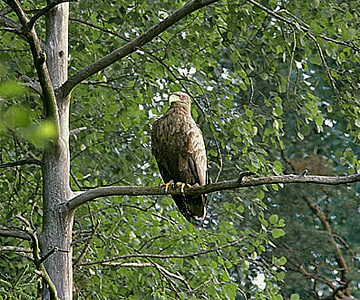 The situation did not improve until the second half of the 1970s, and currently, the number of white-tailed eagle pairs nesting in Estonia is nearing 150.